Our organization: Bosch Car Service is one of the largest independent workshop chains worldwide. As an autonomous brand of the leading automotive supplier Bosch we are always up-to-date. Our international service network offers more than 13.400 certified workshops in 150 countries. We appreciate to have more than 240 million customer contacts each year. Our services: Bosch Car Service is your professional partner around your car. Our experts handle maintenance and repair for all vehicle brands. Benefit from our unique competence and outstanding quality at fair prices. For everything your car needs! 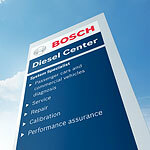 Bosch Diesel Center are the expert service provider for all diesel systems. They offer you professional solutions for the repair and maintenance of state-of-the-art diesel technology, especially if you are a workshop owner, a business customer or a fleet operator. Bosch Diesel Service are the expert service provider for the repair of all mechanical diesel systems. Our experienced technicians diagnose and repair your mechanical diesel injection systems. No matter what type or component - save time and money. Bosch Car Service - the car experts. This is the right address for outstanding service quality for your car. Whether you are looking for advice, repair or service work we can offer the full package - coupled with the unique expertise of Bosch, one of the world's leading original equipment supplier for virtually all makes. Bosch Car Service - For everything your car needs! To find out more, please select your corresponding country out of one of the flags above and read all about the Bosch Car Service network.